Three or Four bedroom property (Main House + 'Ohana' Studio unit; 3746 sq ft/348 sq m) is on a single level with a panoramic view of the ocean. SIX IMPORTANT NOTES that may help eliminate/reduce extra or unnecessary fees or charges: (1) The Base rate is set for UP TO FIVE persons + extra persons charge (your person count above five persons). Weekly bookings (min 7 nights) get a 10% discount so for the maximum savings, consider staying at least one week ;-) (2) Certain fees & charges are intended for large to very large groups. Due to the limitations of the pricing tool, if your are a small group of LESS than ~12 persons, please first submit your inquiry to us and we will adjust or remove such fees as appropriate and then provide you with a revised quote. (3) Via the VRBO portal booking comments section that comes to us, PLEASE tell us the ages on the intended check-in date, of ALL minors <18yrs. (4) Unless specifically requested, the Ohana Studio unit is NOT included in the rate for group sizes of LESS than 8 persons (5) If your group is 12 persons or less, PLEASE tell us if you do not need/want the Ohana Studio unit. (6) You must tell us about ALL minors under 5 yrs of age but for rate calculations purposes, you should NOT include such little ones in the VRBO persons count. Lako Main House (3 bedrooms: 'Master,' 'Twin' & 'Big') has two kings, one double, and ten single beds (or 3 doubles + 4 singles) for a total of 13 beds / 4 baths ..
Lako 'Ohana' Studio room (separated from the Main House) has one king, one double and two single beds; 4 total beds / 1 bath. When sleeping double in king & double beds gives a maximum occupancy of 20-22 persons. * Living Room (376 sq ft): Two sofas, entertainment system (large TV with cable, VCR, DVD, many movies on CD & tape), two couches & chair, large coffee table, and ceiling fan. Access to pool, jacuzzi, barbecue area (back yard). * Master Bedroom (605 sq ft): One king (two persons), and one sofa bed with trundle (two persons). Has TV and VCR, reclining chair, ceiling fan, two separate (his/hers) bathrooms: one shower, one shower/tub, two basins, two toilets, one bidet, two large closets, and two ceiling fans. Private sliding door with access to side yard. Space for optional full-size bed and/or futons (two to three more persons). * Bedroom #2 ('Big Room' / 536 sq ft): One king (two persons), two single (two persons), and two very large couch beds (two to three persons) that can be put together two make a king-size bed. Desk and chair, ceiling fan. Private access to front yard, Space for optional full-size bed and/or futon (two to three more persons). Adjoining common shower and basin area. * Bedroom #3 ('Twin Room' / 209 sq ft): Two single beds (two persons). Ceiling fan, private access to side yard. Bathroom with tub, shower, basin, and ceiling fan. * Bathrooms: All three Main House bathrooms have ceiling fans, hair dryers, shampoo, and hair conditioner. Fourth 'bath' is actually a separated shower and basin area; the toilet is for separate 'guest-use' located in the entry hall area. * 'Ohana' Studio unit (690 sq ft): Studio unit with private access with kitchenette, large living area, ceiling fans. Has TV, DVD player, cable internet connection, phone. Bathroom with tub, shower, basin, and toilet. NOTE: If you do not rent the Ohana, it will be locked and NOT rented to any other group for the duration of your stay at Lako House. * View: Master Bedroom, Living and Dining rooms face the ocean (West) with an unobstructed panoramic 130 degree ocean view from the Lanai. Second bedroom view is to the North (front yard) and the Third bedroom faces South (side yard). The property is on a 19,000 square foot lot and has trees and greenery separating the nearest three neighbors' property to the east and the south. To the west (ocean view direction) and north, the property sits on top of a 30 foot high wall and overlooks the properties far below (no neighbors) and Lako Street to the north. We've traveled around the world quite a lot and find that Hawaii is a natural mid-point between the USA and Asia (another frequent destination of ours). Lako House has groups coming from North America, Europe and Asia. 180 degree view ... can even see the whales swimming by during the Nov-Feb winter months ! 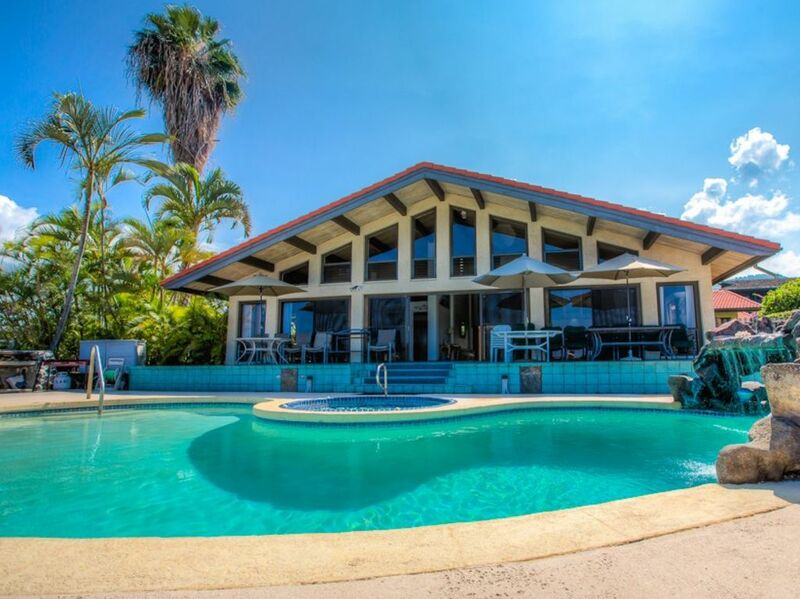 Lako House is also just 5 minutes away by car to the beaches along Ali'i Drive. Free calls anywhere on the Big Island. Gated driveway can accommodate 8-10 cars. Oven in the Main House kitchen. One microwave in the Main House kitchen and another in the (separate) Ohana unit. One coffee maker in the Main House kitchen and another in the (separate) Ohana unit. Main House kitchen also has an electric coffee bean grinder. Basic spices, Plastic wrap, Aluminum foil, etc. Sufficient enough to support 22 persons staying. Full kitchen with all one would expect to have to cook for everyone, etc. 3 TV's: Living Room, Master Bedroom, and Ohana. Have (additional) spare TV if needed in the Twin or Big rooms; please inquire if needed. Extensive book shelf area in the Big Room; English and Japanese language books. Lanai has 3 tables and total of 16 chairs ... For larger groups, additional tables & chairs are available upon request. Single floor only and the only steps that exist (from the lanai to the pool level) also has a separate / companion ramp to provide the same access. Note that showers and tub showers have a (one) step to be navigated to enter. Lako House PRIVATE pool only shared with house next door (HND) when both properties are booked via VRBO by the same guest. We had a very enjoyable stay in this large, comfortable home. The view was spectacular and the house layout was excellent. Thank you again Ken .. Please do come back and visit Lako House again in the near future. Large house with plenty of beds and restrooms. Backyard has an accommodating pool and amazing view. Didn’t realize how great the view was until we arrived. We will definitely try to book this house again in the future. The Lako House is perfect for larger groups. This was our second time here, in the past three years. We absolutely love it! Good location, lots of room, great layout, clean and well stocked. Bill is “Mr. Aloha”. He is always pleasant and helpful. Bill is easy to talk to to whenever issues may arise. He seems genuinely concerned about our comfort and experience in the house. We want to be in this house when we come to Kona for our yearly soccer tournament. It would be nice is if we could have the same time slot for the Lako House every year! Hello Warren ... OMG ! ... 'Mr. Aloha' (my wife is now 'dying' from laughter) .. I guess there may be a first time for any thing ... Anyway, MUCH Mahalo for the very kind comments and you folks treating our home with so MUCH Aloha. We certainly look forward to having you all back again next Feb and for many (?) years to come !! Lako House was a great find. When we booked it, it seemed a bit out of the way, but when we were there we quickly found the location to be ideal. It was central to everything we did, and away from heavy traffic. We had six adults and six kids staying there, but it never seemed crowded and everyone had their own space. The large kitchen was crucial to our stay and we made use of all the amenities. The kids loved the pool. I think they would have been just as happy to stay at the house the whole time over going to the beaches. The view is amazing! We saw whales from the patio two of the nights we were there. Bill, the host, was also easily accessible and quickly solved any problems or answered any questions we had. Overall we had a lovely stay in Kona, in no small part thanks to our accommodations. The home and grounds are beautiful. There was 13 of us. We stayed there most of the time. Why leave? A perfect peaceful vacation. The description was exactly what it was. Bill was unbelieveable in all our requests. I would highly recommend to anyone. Already have. We enjoyed staying here as a group of 9 for 5 days. A big kitchen and dining were very comfortable to use, and all the equipments and amenities were plenty good enough. Quiet nice neighborhood kept our sleep well and the location was very convenient to go everywhere! The owner was so kind and friendly on the phone, so that I recommend this house if you are coming to Kona as a big group. Mahalo Shizuka-san for your kind feedback and repeated visits to Lako House. We look forward to hosting one of your groups again in the future ! IMPORTANT: At this time (01 Feb 2019), the VRBO rate tool no longer enables hosts to set minimum persons count by season. To this extent, PLEASE understand that our minimum base persons count during Peak/High Seasons dates (Jan-Mar, Jun-Aug, Kona Ironman, Dec 15 to Jan 5, and USA holiday weeks) is 12 persons, NOT 5 persons. To this extent, we will customize your rate quote to your particular persons count and season booked. NOTE: Main House has 3 bedrooms, (13 beds / 4 bathrooms) and with the separate Ohana Studio unit (4 beds / 1 bathroom), this gives Lako House groups a possible 4 bedrooms total + 5 bathrooms (17 beds). If your group is 10 persons or less and YOU do NOT want the Ohana unit, please let us know and we will adjust your quote (down) appropriately. NOTE: If you do not rent the Ohana, it will be locked and NOT rented to any other group for the duration of your stay at Lako House. For group sizes 11 or more, the Ohana is mandatory and included in the rate. CANCELLATION Policy: Cancellations ARE permitted but there are also cancel fees levied depending upon the timing of the confirmed cancelation request. Please do see the Lako House 'Rental Agreement' on the VRBO portal for our cancellation policy. Cancel fees are calculated based upon season booked (Peak, High, Standard, Low) and how much notice was given at the time of the cancellation request.